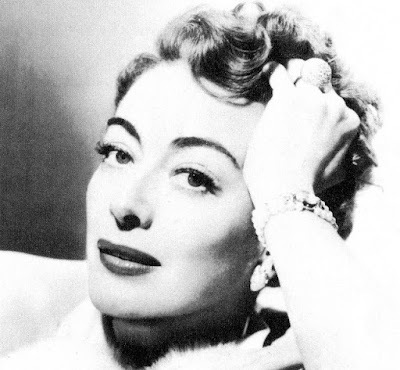 The forties were an interesting time for Joan Crawford. In that decade she left her long time studio MGM for Warner Bros, finally won a coveted Oscar for best actress (Mildred Pierce ) and her performance style matured beyond the movie star mannerisms upon which she'd relied so heavily in her early career. 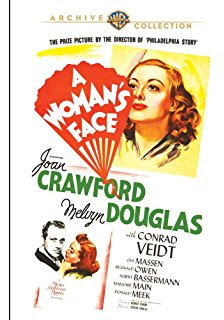 Two of Crawford's best titles from this era, A Woman's Face (1941) and Flamingo Road (1949), from MGM and Warner Bros. respectively, are now available on DVD from Warner Archive. Crawford was in the last years of her long association with MGM when George Cukor directed her in the Hollywood remake of A Woman's Face (Ingrid Bergman starred in the Swedish original in 1938). She is Anna Holm, a woman made bitter by an ugly scar, that covers one side of her face, the result of a childhood accident. Unemployable, she runs a tavern as a cover for a large blackmail operation through which she takes pleasure in torturing ladies who have the kind of breathless, illicit romances she only dreams of having herself. One night at her establishment, she hosts the charming and wealthy Torsten Barring (Conrad Veidt). Though he can have any woman he wants, he is intrigued by Anna, connecting with her darkness. She is stunned by the attention, and falls in love for the first time. When Anna is caught in the midst of blackmailing unfaithful wife Vera (Osa Massen) by her plastic surgeon husband, Dr. Gustaf Segert (Melvyn Douglas), the doctor insists on fixing her face. In some respects it is a matter of pride for him to attempt the surgery, but he also claims that he wants to know if she will remain ugly inside if she becomes superficially beautiful. The operation is a success and Anna's whole life changes, but in her new beauty Torsten sees only the means to achieve his own dreams. He convinces her to take a job as nanny for his nephew, the only person who stands between him and a large inheritance, so that she may kill him. She takes the job, and under Dr. Segert's watchful eye, struggles with what ugliness remains in her when faced with a kinder, more welcoming world. It is thanks to Cukor that Crawford seems to have matured overnight as an actress here; this is a transformative role for her. He insisted, with her agreement, that she drop her movie star act and truly become her character. Together they worked to make Anna angry, humble, tender and conflicted. It is one of her most complex performances and one of the first times the actress truly got lost in a role. 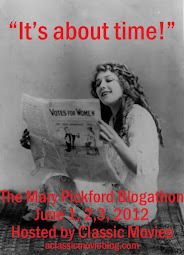 The film itself has plenty to say about women, and how their self-worth and value in society is tied to beauty. As an actress beginning to be seen as past her prime, Crawford must have felt Anna's turmoil deeply. She also was seeing her value decline because of age, though she was on the cusp of achieving some of the best, most unaffected performances of her life. Special features on the disc include the short You Can't Fool a Camera, the cartoon Little Cesario, two radio adaptations of the film, one starring Ida Lupino, the other Bette Davis, and a theatrical trailer. 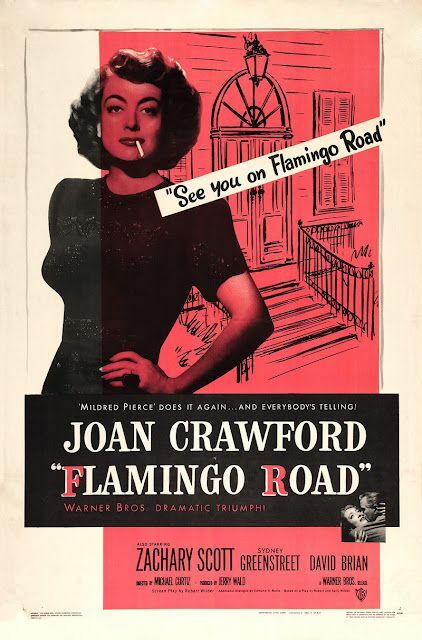 Crawford was well into a successful run at Warner Bros. Studios when she made Flamingo Road with director Michael Curtiz. She had won the Oscar and achieved some of the best performances of her career in films like Humoresque (1946) and Possessed (1947). It was also the start of a period where, while the actress was maturing as a performer, she continued to take parts for younger woman, which sometimes gave an odd feeling to a film. This small town drama is one such occasion, where she plays a carnival showgirl who should be in her late twenties or early thirties, but 40-something Joan, who was at least aging gracefully, makes it work. As dancer Lane Bellamy, Crawford is tired of skipping out on hotel bills and constantly traveling with the low-class carny set. She decides to settle in a Southern town, attracting the attention of deputy sheriff Fielding Carlisle (Crawford's Mildred Pierce costar Zachary Scott), who buys her a meal and gets her a job. This is all to the chagrin of Sheriff Titus Semple, who is grooming Carlisle to one day serve as his puppet governor. Semple bullies everyone, this is a man who becomes angry if he is not given a separate chair for his hat, but he is hardest on Lane. He gets her fired, has her picked up for soliciting and does everything in his power to get her out of town. Yes she is not good material for a politician's wife, but Temple also seems to find it unnerving the way Lane has of detecting and speaking the truth, something he works very hard to conceal when it proves inconvenient. Years on the carnival circuit have toughened Lane though and she refuses to back down. As she builds a life for herself, finding work, and eventually marriage and a home, Lane faces constant pressure from Semple. He treats everyone with contempt, calling Fielding "Bub" as if to continually reinforce that he considers the younger man beneath him, and only a tool for his use. While while he presents an exterior of smooth, psychopathic evil, from the way he guzzles milk instead of liquor it seems he is suffering from ulcers, a sign of a man who is more tormented than he lets on. Flamingo Road plays like a melodrama, but has the look of a film noir. Even on a sunny day, long shadows haunt Semple's porch, a constant reminder of the grime beneath the cheerful exterior of the town. Lane is set up at every turn to be the victim of that darkness, but she is stronger than the easily blackmailed men who give the illusion of being in control of that town. Special features on the disc include the featurette Crawford at Warners, the cartoon Curtain Razor, a radio adaptation of the film and a theatrical trailer.